A general guide on the Garrisons in Warlords of Draenor. One of the most anticipated features that the World of Warcraft expansion: Warlords of Draenor has brought to the game are Garrisons. Garrisons are, in a nutshell, player housing. Players will finally get their chance to own their own little slice of Draenor in this new expansion. In typical Blizzard fashion the addition of player housing is not just a place to hang your hat, they have added a whole lot more to it. Below you will find the very basics that you need to know to get started successfully in your very own Garrison. Enjoy! Player housing in Warlords of Draenor will be called Garrisons, but they have the potential to become much more than just personal space. Build your own base of operation called a Garrison that can be upgraded over time. Garrisons hubs are located in Shadowmoon Valley for the Alliance and Frostfire Ridge for the Horde. Access to a variety of buildings that grant special benefits. Able to build outposts in other zones that will give you zone-wide perks. Collect NPC's of your own as Followers. Use Followers to complete various tasks. 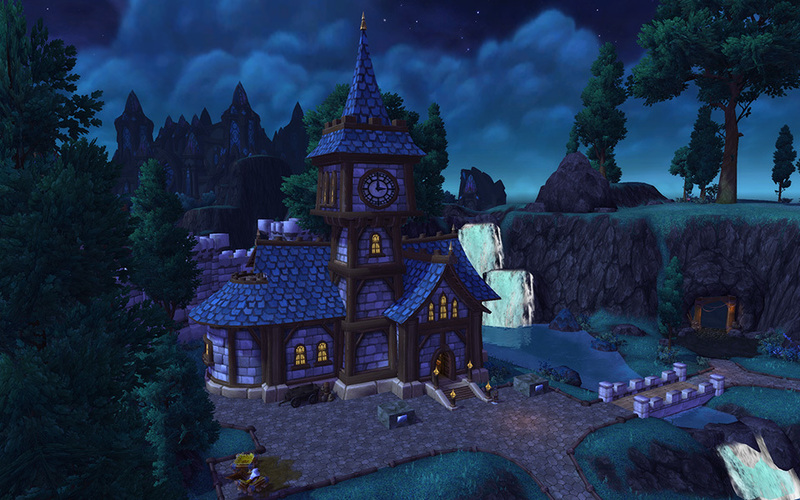 Once you build your Garrison you will find several plots to build buildings upon. More plots will also become available as your Garrison gains levels. Level 1 of your Garrison will be unlocked by following the normal quest line in Draenor. Initially your Garrison will be very small. After completing the first quests to unlock the Garrison, your fort will be set up, a Barracks will be built, and one Follower will be recruited. Boasting only one small plot and one large plot, the number of building you can build are rather limited. Your Garrison can be upgraded to level 2 at level 92 or sooner by completing the questline Bigger is Better. Upgrading will cost 200 Garrison Resources and will also teach you all of the level 1 small, medium, and large blueprints (except for the Salvage Yard). When you Garrison reaches Level 2, things will really pick up. You will now have access to two small, one medium, and one large plot. Specialty buildings such as the Herb Garden, Fishing Shack, and Lunerfall Expedition/Frostwall Mines are also unlocked at this time. Your Garrison will also slightly change it's appearance with more impressive buildings and more fortified walls. Players may upgrade from Level 2 to Level 3 once they hit 100 with their character. It will require a deposit of 5,000 Gold and 2,000 Garrison Resources. At Garrison level 3 more plots than ever become available. Three small, two medium, and two large plots leave the player with many options. Players also gain access to any Level 3 Blueprints they have earned from achievements. As mentioned above, Garrison plots come in three sizes; small, medium, and large. Each plot can hold one building of that size. Level 1 blueprints for your profession related small buildings can be acquired by completing a short questline. The starting quest comes from an item that drops from Draenor mobs and starts the quest Shadows Awaken for Alliance or The Butcher of Bladespire for the Horde. Upgrading your Garrison to level 2 will unlock any remaining level 1 small blueprints, except for the Salvage Yard. Level 2 blueprints will require the player to have reached level 96 or completed the Talador Outpost quests. Level 3 small blueprints become available after completing the Working More Orders achievement and hitting level 100. After your Garrison reaches level 2, you automatically learn all Medium level 1 blueprints. Level 2 blueprints for medium buildings require the player to have reached level 98 or complete the Spires of Arak Outpost quests. While Level 1 Medium blueprints are free, Level 2 blueprints will cost 1,000 gold, unless you have an Outpost Building Assembly Notes which can be obtained by completing Spires and Gorgrond Outposts quests. Level 3 Medium blueprints cost 1,000 gold. Your first large building will be the Barracks and is obtained doing the introductory Garrison quests. When upgrading your Garrison to level 2 you will unlock the remaining level 1 Large blueprints, except for the Salvage Yard. Level 2 blueprints for Large buildings requires level 100 or completing the Nagrand Outpost quests. Level 3 Large buildings are unlocked via a special achievement after hitting 100. Each building you build will provide various benefits to you, such as profession reagents or other resources. There are three building sizes that correspond to the plot sizes; small medium and large. Small buildings must be build on small plots, medium on medium plots, and large buildings on large plots. Each building size has a distinct focus. Small buildings focus on professions, medium buildings increase Garrison productivity, and large buildings enhance Followers. All buildings are useful in their own individual way. Each building place can be leveled up and will provide increased benefits as this happens. The player will need to choose wisely which buildings they wish to use, there are more buildings available than plots. Thus, some buildings will ultimately remain unbuilt and their benefits untapped. However, players can tear down and place new buildings at any time. The base of your Garrison will be at the Town Hall. Once you have this building you will expand out from that to other buildings. This central building will be the hub for sending your Followers on missions, the place to upgrade your other buildings, as well as purchase Level 2 Blueprints. Garrison Resources are the lifeblood of your Garrison. They are used to construct and upgrade all the buildings and to also level your Town Hall. There are various ways to farm Resources many of which are detailed in our Garrison Resource Farming Guide. In addition to the great options provided to you from having a garrison, you will also be able to collect followers at the Garrison. These followers will be gathered in multiple ways, either through questing, faction levels, or even as quest rewards. Followers will come in various specialties and rarity levels. You will be able to find tank, healer, and DPS followers. Followers can also provide bonuses to your buildings, like the ability to change the appearance of your weapon enchant. Followers will essentially be simplified characters that you control. They will have their own level, item level, professions, and abilities. These will all be able to be changed and improved as you level them up through the use of Garrison missions. When not on those missions Followers will hang out and perform tasks around the Garrison. This means you will be able to visit them in game and interact with them. Followers can also be assigned to individual buildings to provide further benefits. Once assigned to a building, the Follower will no longer be available to participate in Missions. One of the coolest things about having followers in your Garrison is that you will be able to send them out on various missions. These are like quests, but only for your followers. You will get new missions all the time that have various time limits, objectives, and rewards. View these missions and assign your Followers to them via the Town Hall or Outpost. Better yet, all of these things can be assigned to them and then the followers go out and complete progress on these tasks even while you are not in the game. This means you can still accomplish things without spending every waking second inside your Garrison! Successful completion of missions will depend on your Follower's level, item level, party buffs, and abilties. You will find that many buildings inside your Garrison contain Work Orders. Work Orders allow you to convert one resource into another. This is an excellent way to generate resources for a particular profession, without actually training that profession. The number of Work Orders you can complete depends on the level of the building you are using. Level 1 buildings allow 7 orders, Level 2 14 orders, and Level 3 21 orders. Orders currently take 4 hours to complete. When complete, a clickable crate will appear next to the building that you can loot. The Storehouse allows you to increase the number of Work Orders in queue and assigned a Follower to that building will increase the total yeild of the order. Of course with something as big as Garrisons, there are bound to be some achievements thrown in the mix. Achievements range from easy to hard to obtain and cover all bases of creating your Garrison. Players will find achievements in the following categories; Buildings, Followers, Missions, Monuments, and General. Grand Master of All – Raise all primary professions to 700 skill. Defender of Draenor – Get 5,000 honorable kills in Draenor. Mythic Draenor Raider – Complete the mythic raiding achievements set forth by this achievement. Master of Apexis – Collect 25,000 Apexis Crystals. Master Draenor Crafter – Craft 50 Epic Items with an item level of at least 600. Draenor Pet Brawler – Win 2,000 pet battles in Draenor. Garrisons can currently only be build in two zones (one for each Alliance and Horde). To mix it up a little, players will be able to build Outposts in various Draenor zones. Four Outposts can be active at any time across all the zones. At level 100, you may switch an outpost in a zone for 10,000 Gold. These Outposts do not work exactly like your Garrison. You cannot construct or level up buildings here. However, you can build unique buildings here. These buildings provide zone-wide perks and quests that reward you with followers and currency that will allow you to buy high-level blueprints. Four Outposts can be active at one time across all zones. Do you have any information, tips, or tricks about Garrisons not seen here? Feel free to share it with the community in the comments section below!